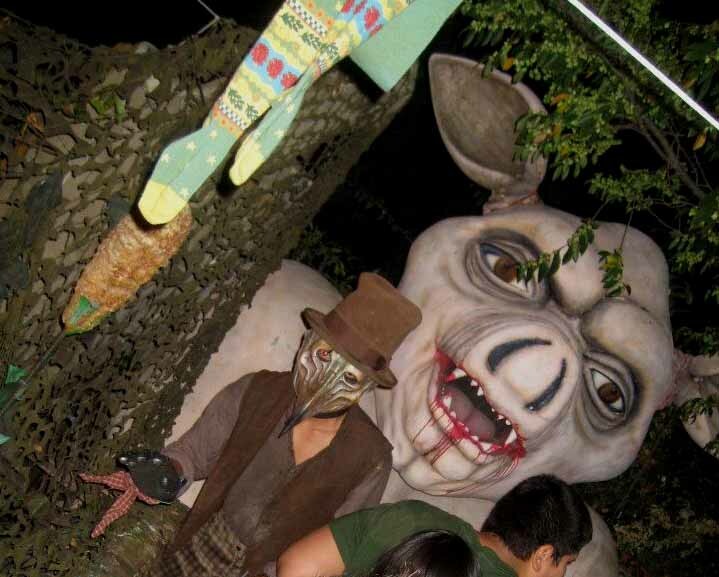 The Backwoods Maze: Scariest Halloween Home Haunt in L.A. 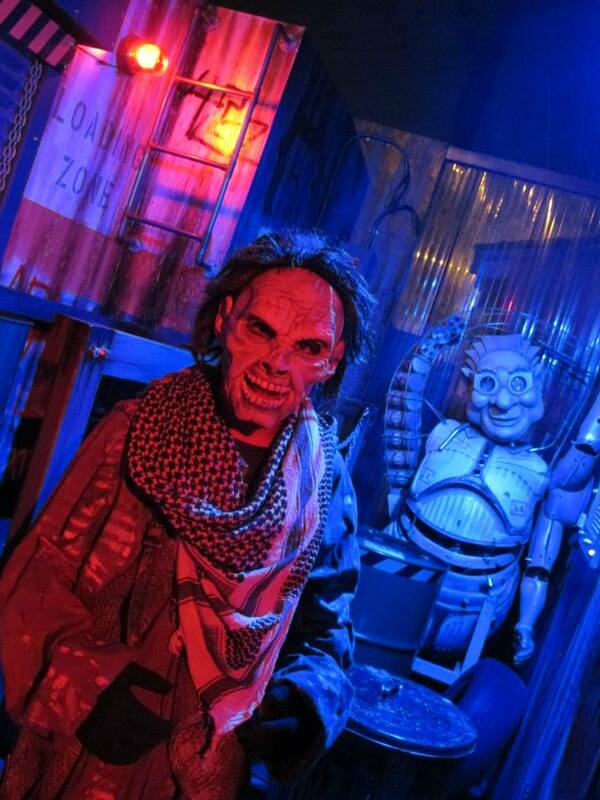 This amazingly lengthy tour of terror is as effective as any professional Halloween haunt. 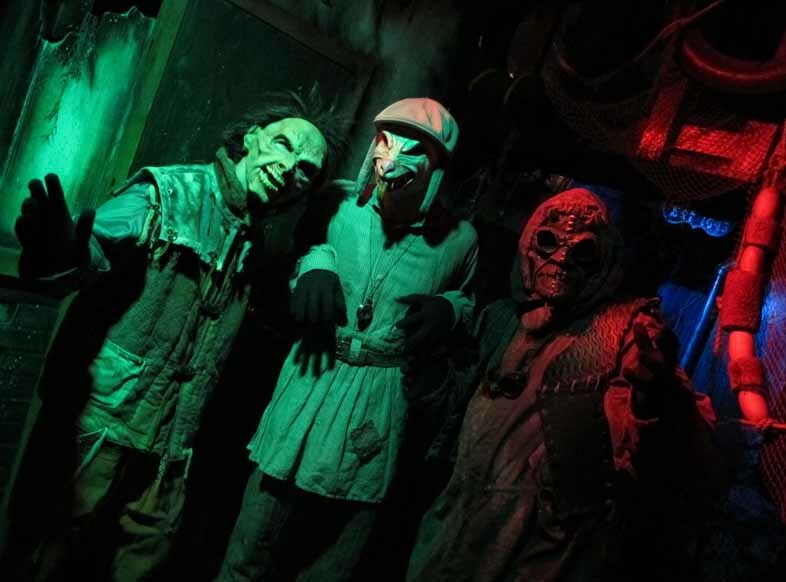 The Backwoods Maze is not a traditional haunted house; though there are some convincing interior sets, the experience is more akin to a race through some post-apocalyptic backwoods hellhole, with mutants, cyborgs, and depraved cannibals every corner. Note: This page has had "shocking" content removed in order to be in compliance with AdSense standards. If you would like to see this page uncensored and ad-free, please consider making a donation by clicking here. 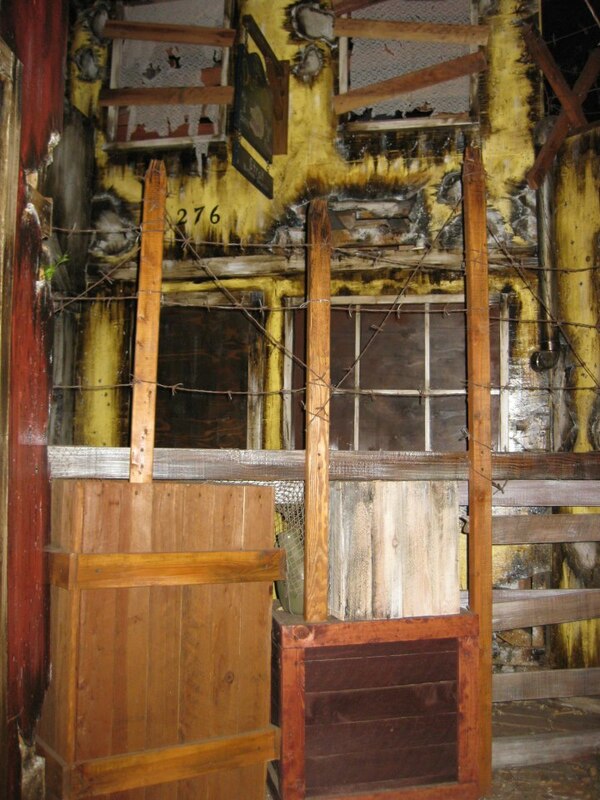 After making its debut in 2003 as the Haunted Experience in 3D, this amateur Halloween attraction changed its theme to the Backwoods Maze in 2004, taking visitors into the depths of rural Texas for a tour of Farmer Porky's farmhouse, where pigs and cows were not the only livestock on the menu. 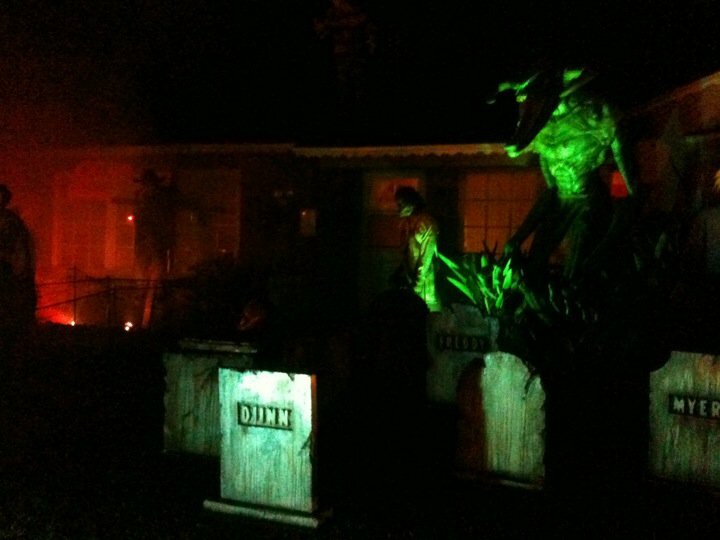 The front yard set the tone - a cemetery loaded with tombstones and monstrous mannequins, including Jason, Freddy, Michael Myers, and one demonic figure towering 12-feet high. This rather bold display raises high expectations for the maze - which, fortunately, are satisfied by horrors too intense for impressionable young kids out for some easy candy. 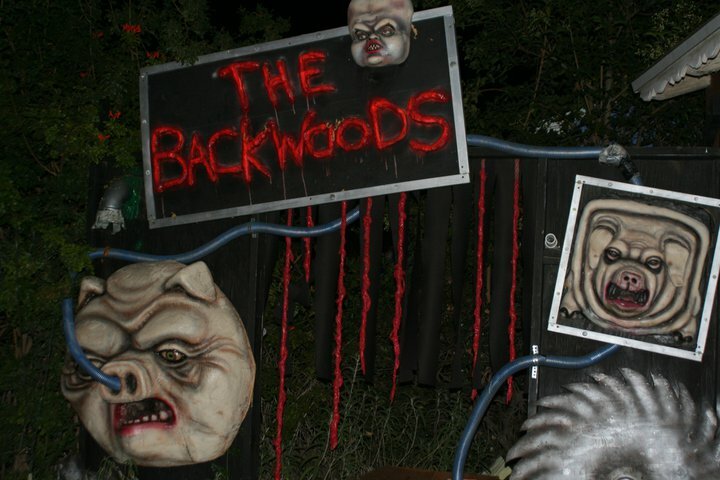 As the title implies, the Backwoods Maze offered a rustic setting, with several mutant cannibals. The "rural loonies" theme yields effective results. The maze benefits from a careful layout that effectively uses the available space: it seems far too long to fit into the back yard of a typical neighborhood home. For an amateur effort, the sets and props are impressive, with some gruesome grand guignol on display; everything looks home-made or at least heavily customized, not off-the-rack. The actors wear masks rather than makeup, but they are very detailed, and the costumes are accessorized to suit the backwoods setting, and the cast are really into their roles (although they will back off for a cute puppy). 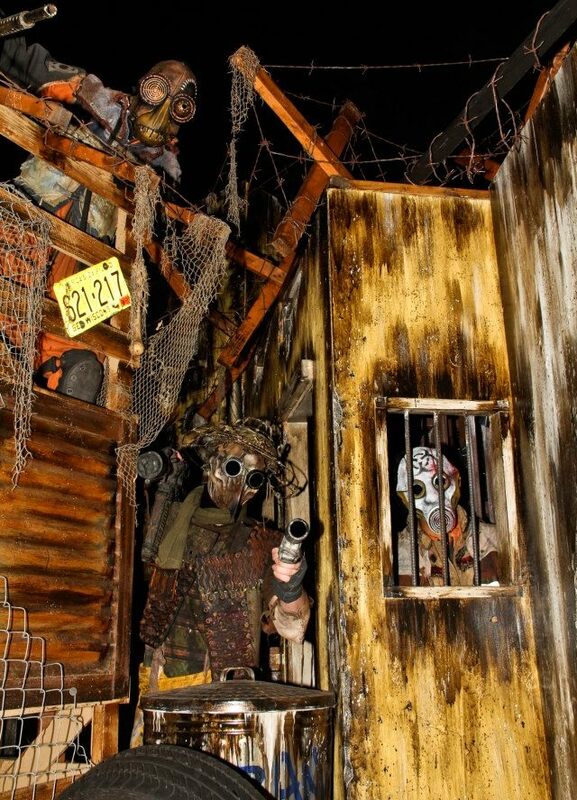 2012: For this Halloween, the Backwoods Maze left the slaughterhouse behind, instead offering a "journey into the heart of a once prosperous city that has fallen victim to a devastating war. 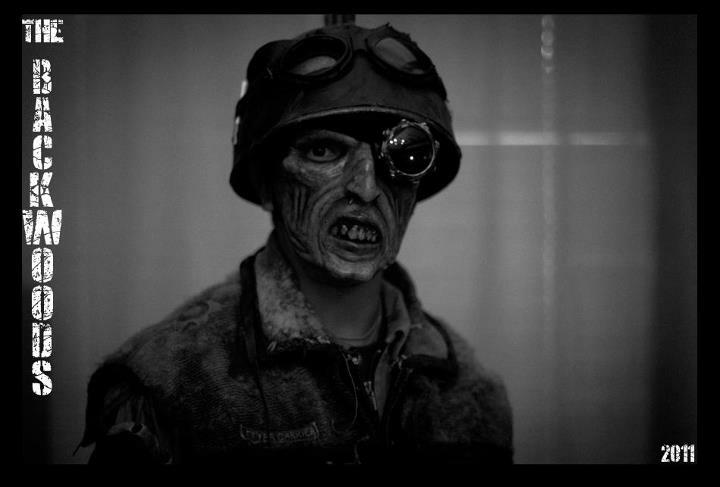 An army of unknown origins has overtaken and morphed this town into a wasteland under siege. Maneuver past guard towers and trudge through the trenches in a world without law and order. Chaos prevails as hostile warlords and scavengers who are starving to survive warp this town into a barbed wired war zone." 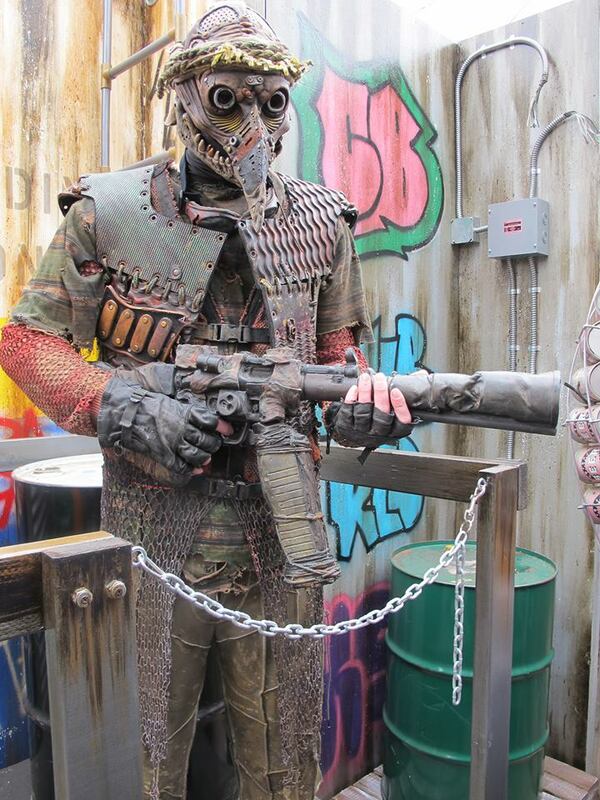 2013: Burbank's scariest home haunt presented a a new futuristic, post-apocalypse theme: " Death Race Rumble, the wasteland's deadliest auto-combat duel!" 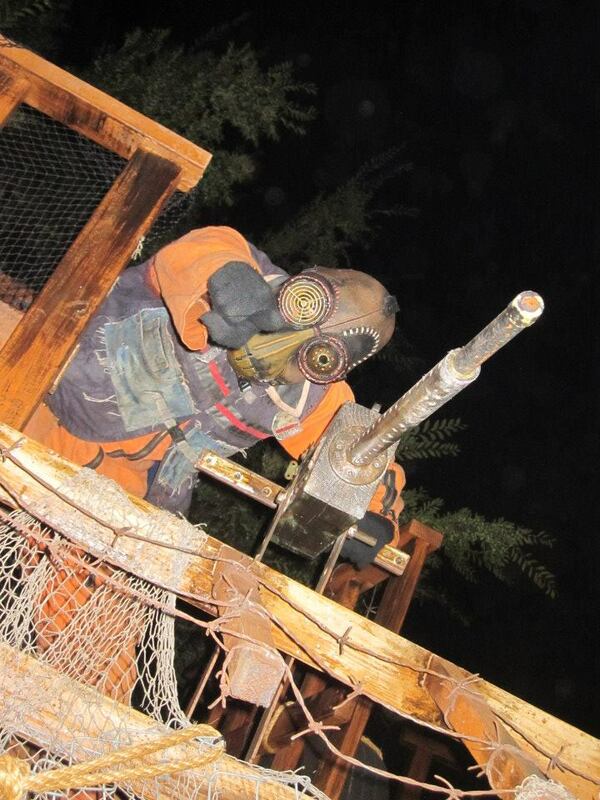 2014: The Backwoods Maze offered another variation on the post-apocalyptic theme, which asked guests to "Enter a post-apocalyptic wasteland and bid farewell to flesh as you find yourself launched into a futuristic society in which humans are rendered obsolete and mechas reign supreme. Artificial intelligence initially devised to enhance the human life is now the core of a worldwide revolution governed by an empire of hostile simulators. 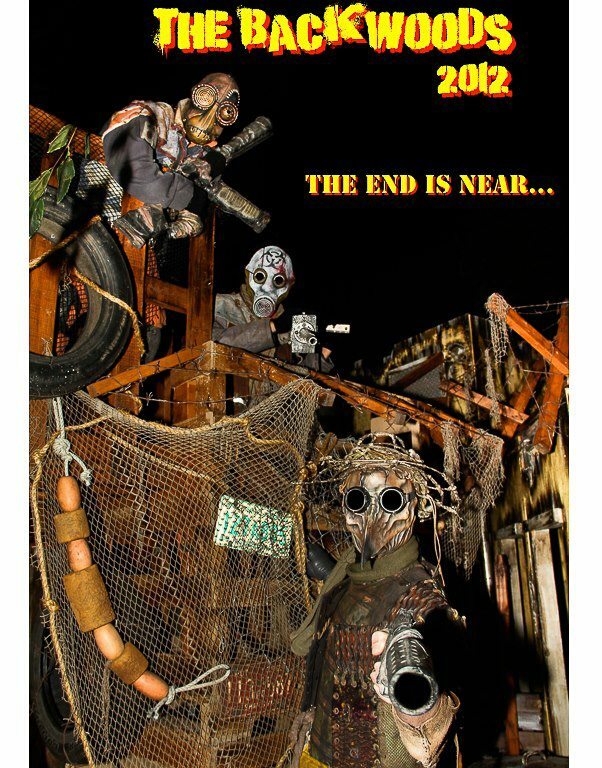 Survivors rampage through the wreckage in search of the globe's remaining gasoline, piloting heavily armed deathmobiles in this anarchic free-for-all inhabited by lethal automatons and savage raiders thriving on the termination of law and order."